The edging on your crochet projects is what really makes them stand out. Without an edging, a piece can be pretty but it won't look polished. Just by adding a single row of special stitches at the end of the project, your crochet can go from "okay" to "wow"! Even a simple single crochet edging can give you work a more finished look. However, more advanced stitches will stand out even more and are a good tool to have in your crochet toolbox. The shell stitch is a great example of a stitch that you can add quickly to your projects to give them that extra special something that makes them look spectacular. 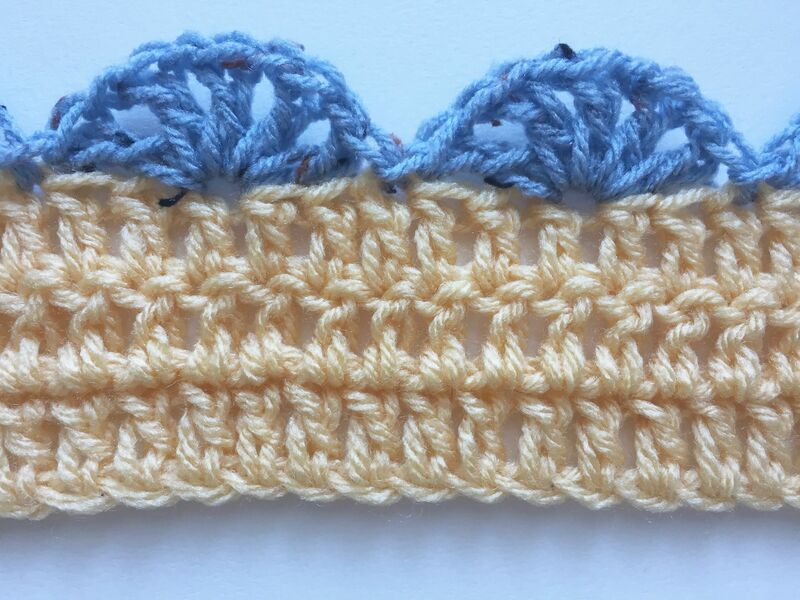 This shell stitch is made using double crochet stitches that are separated by chain spaces and slip stitches; these are easy stitches that a beginner could confidently tackle. A similar variation on this is the v-stitch crochet shell, which has sets of 2 dc separated by a ch-1 space that creates the v-stitch shape. The crochet shell stitch is a very versatile edging. You can add it as a single row at the bottom of your projects; it looks great on the bottom of a crochet shirt, for example, or on one side of a crochet pillowcase. The crochet shell stitch also works great when added to the top and bottom of a project; scarves and blankets become more unique when finished off in this manner. Or, of course, you could work this single row edging all the way around the entire border of a project. This crochet edging is designed to work on projects that are a multiple of 6 + 1 (for example, 31 stitches across or 61 stitches across). That said, you can cheat the edging a little bit to adapt it to other projects; this option is discussed at the end of this tutorial. You can crochet your edging using any yarn that you want, although it is most common to use the same type of yarn for the edging that you have used for the rest of your project. If you want a subtle look, work the edging in the same color as the project itself. If you want a design with more pop, try a complementary color. Use the same size crochet hook for your edging as for the rest of your project. If you are going to create your crochet edging with the same yarn (including same color) as the final row of your crochet project, then all you need to do is finish you project, turn the work, and crochet a slip knot in the first stitch of the row. If you are going to use a different color from the main project color, then you need to finish off the project (weaving in ends at this time if you wish), and get ready to join a new yarn. You will join your yarn in the top right corner of the work (assuming a right-handed crocheter). To join the yarn, make a slip knot of the edging color on the crochet hook and then slip stitch into the first stitch of the row. Now that you have created your first slip stitch, it is time to create your first crochet shell. Skip the next 2 stitches. (In other words, you will have five dc stitches each separated by a ch 1, all worked into the same space). Skip the next two stitches and slip stitch into the following (third) stitch. Then all that you need to do is continue crocheting shells all the way across the row, repeating Step 4 above until reaching the end of the row. You will end with a slip stitch in the final stitch. If you are only adding this edging to one row of the work, then you will end off and weave in ends. If you are adding an edging to the opposite side (top or bottom of the work) then you will simply rotate the work, join the yarn with a slip knot in the (new) right top corner and repeat the shell stitch across that second row. If you want to add the shell stitch edging all the way around an entire project, such as a placemat or a blanket, then you will need to know what to do when you reach the corners. It is easy. After the final slip stitch of the row, chain one to adjust for the corner. Then slip stitch into the first stitch on the new side of the work. Continue working the pattern as normal to the next corner. Double check to make sure that the number of shells on one side is the same number as the number of shells on the side opposite to it. If you are lucky (or you planned everything perfectly) then the sides of the project will be a multiple of 6 + 1 and your shell stitch will fit perfectly on every side. But don't worry if that's not the case. You can cheat your shell stitch a little bit if the count is slightly off. There are two good ways to do this. Alter the center of the row. At the center of the row is a slip stitch, skip 2, shell, skip 2, slip stitch. You can adjust the count here by skipping fewer or more than 2 before and after each shell. For example: slip stitch, skip 1, shell, skip 1, slip stitch. If you have to skip more (instead of fewer) to get the right count then you will need to add chain spaces. For example: slip stitch, ch 1, skip 3, shell, ch 1, skip 3, slip stitch. Slip stitch at the corners. Another (easier) option is to simply add additional slip stitches at the beginning and end of each row to get the right number of stitches in the middle to create a multiple of 6 + 1. For example, if you have a row of 33 stitches, adding a slip stitch at the beginning and end of the row (in addition to those that already exist in the pattern) will give you a count of 31 (33 minus the 2 slip stitches), which is a multiple of 6 + 1.